NOW: Last January's “nearly big snow” was, perhaps, as disruptive as our last sizeable snowfall – the one of 2008. But it was surely a kinder blizzard, one that did not upset the career of a two-term mayor. 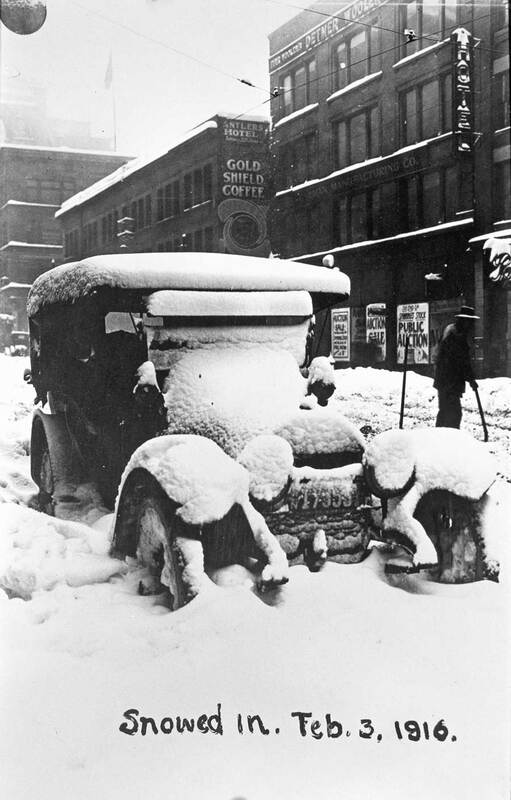 On the third day of the four-day snowstorm that visited us last January – the one that kept schools closed, and had auto body shops polishing their tools for the expected parade of clanking fenders – Jean drove downtown, carefully. 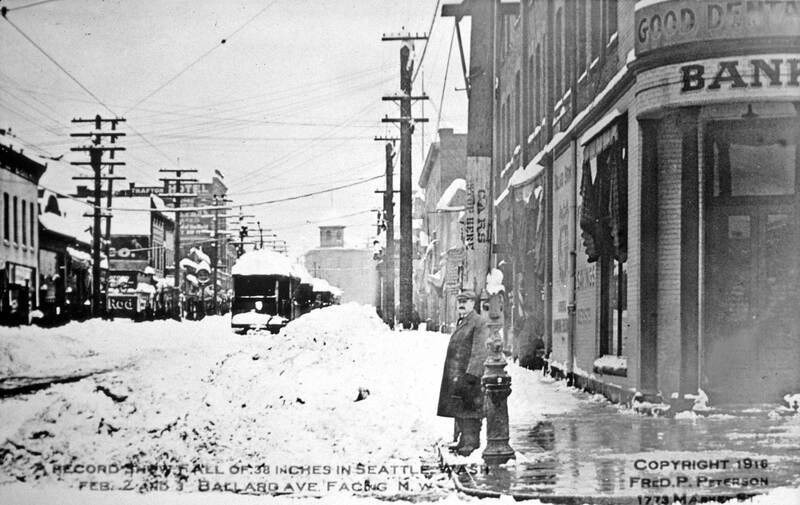 His repeat of the historical snow scene that looks south on Second Avenue from Pike Street is relatively lean on snow but seems just as cold as the earlier snow – or colder. 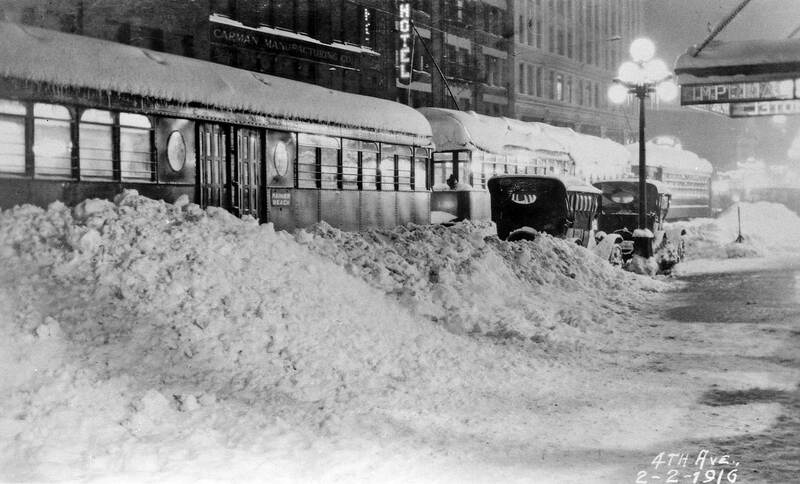 The psychological warmth of the older snow might have something to do with the glow reflecting from the 5-ball cluster light standards, Jeweler Benjamin Gates sidewalk clock and the many snuggling store fronts that once made this stretch of Second Avenue one of the city’s most sparkling commercial strips. As for “shoes,” fourteen of the 34 Seattle shoe retailers listed in 1915 were located on 2nd or within a half block of it. Of the 34 one – or half of the Wallin and Nordstrom, far left – is still boosting shoes in Seattle, although not at this corner. As you know, Paul, I wandered around downtown for a couple of hours. Here are a couple repeats and a playful angle for your amusement. 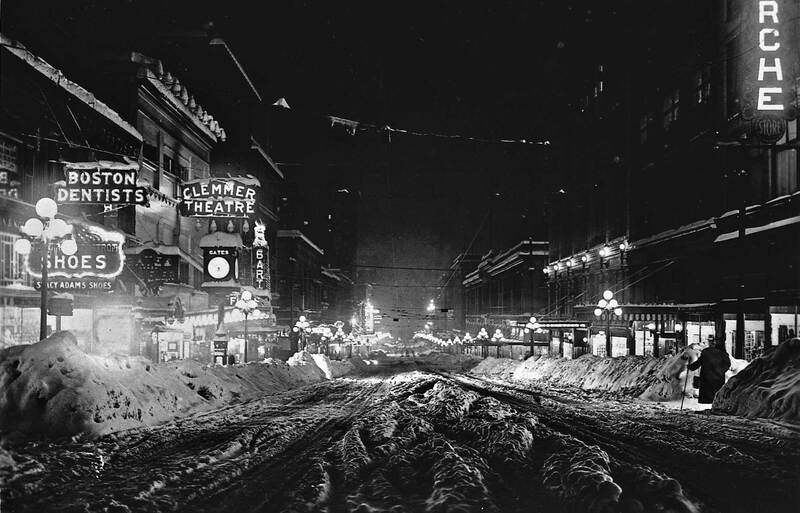 The “Big Snow” of 1916 was a weeklong spectacle that may be the single most photographed event in the history of the city. (I’m referring to “unplanned events” here; world fairs and summer festivals don’t count in this calculation.) 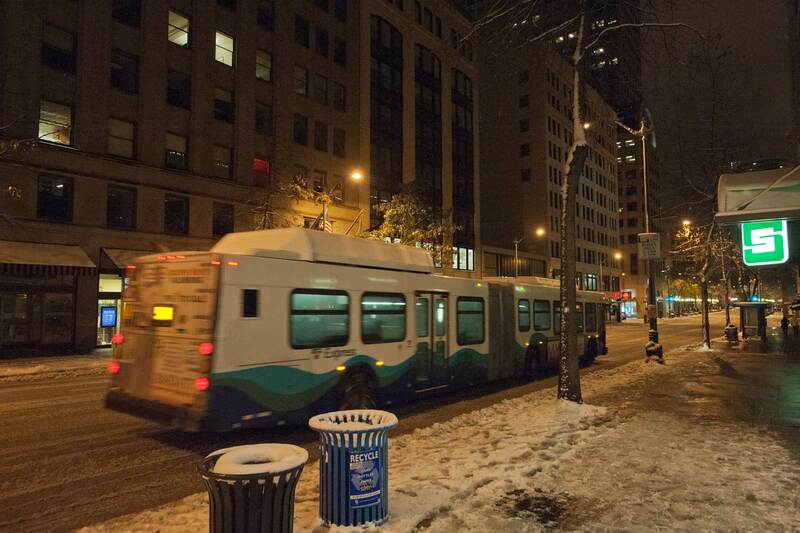 Probably everyone who owned a camera got it out between Sunday, Jan 30 when the snow began to fall and the following Sunday Feb. 6, when the first snow-stalled trains – 19 of them – reached Seattle. 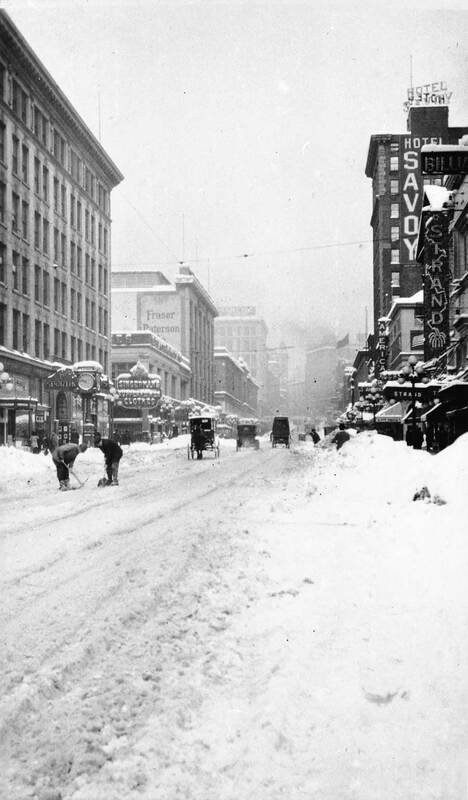 On Monday the 7th, city streets were sufficiently cleared so that all the streetcars lines were again in operation. 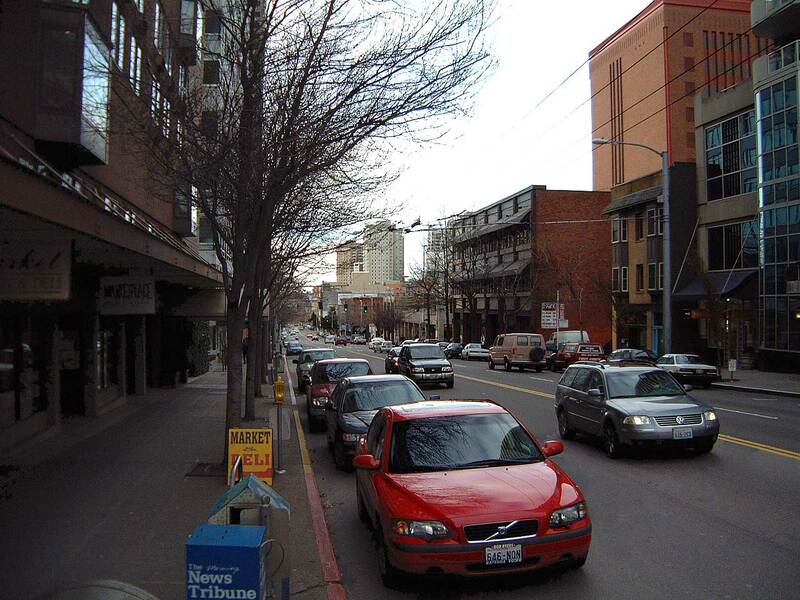 This view looks south on First Avenue from Virginia Street. 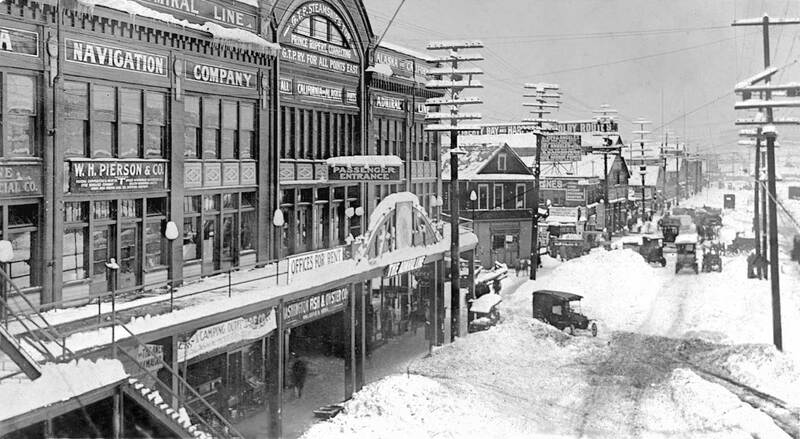 In 1916 the street was lined mostly by one to three story structures – a mix of frame and brick – that would typically have “rooms” upstairs and businesses at the street level. Between Pine and Bell streets the structures on the west side of First Avenue (like those on the left side of this scene) were generally a few years older than those on the east side of First. The reason was regrades. Between 1900 and 1903 the east side of First north of Pine Street was effectively a cliff until the Second Avenue Regrade of 1903-06 moved this steep bank one block east to the east side of Second. 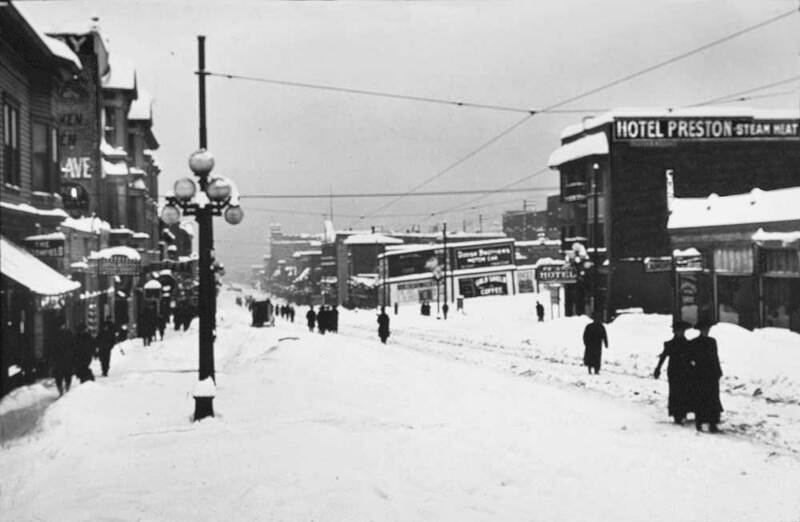 With its modern grade the buildings on the right of this scene, like the Hotel Preston, could be quickly built to prosper, it was hoped, in a brave, new and nearly level Belltown. Instead, the commonplace urban legend that attaches itself to many small old hotels that at some point they operated also as “harlot hotels” may actually be true here on First Avenue. Belltown never really recovered from the depression of 1907 until the 1970s when it began its transformation into a Seattle mini-version of Vancouver’s West End; a neighborhood of high-rises. No enthused amateur recorded this snapshot. Rather, James Lee, for many years the official photographer for the city’s Department of Public Works, made it. Lee’s work has been shown many times in this weekly feature. 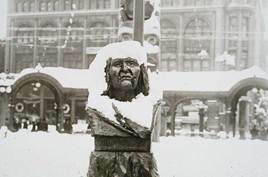 I am thankful both to him and the 1916 Snow, which has also frequently fallen here. 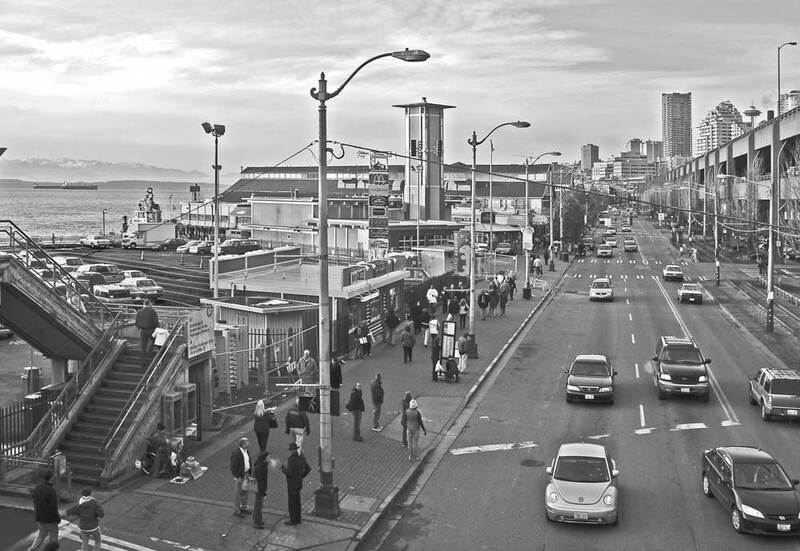 In 1935 when motor vehicles already dominated the waterfront Railroad Avenue got its name changed to Alaskan Way. 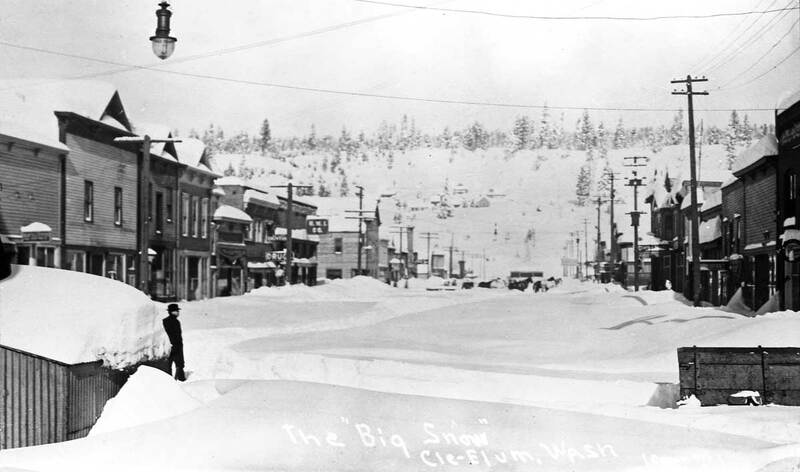 One of the marks for the community’s passage of time is our Big Snow of 1916. While still celebrated it is, of course, increasingly not remembered. 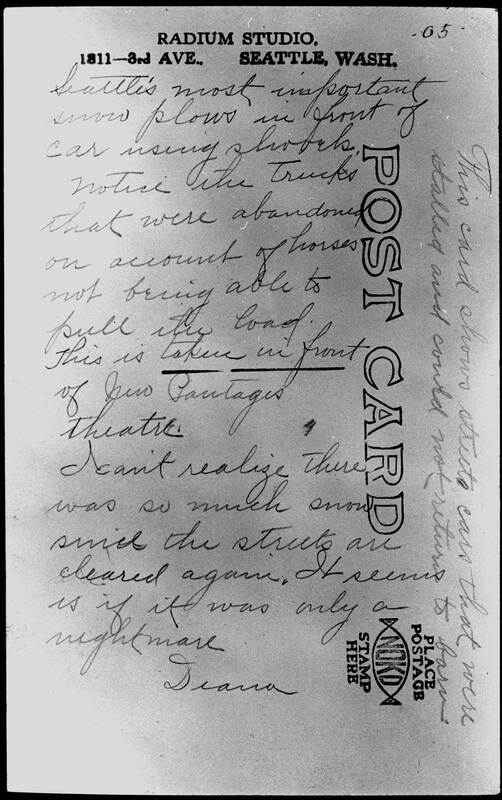 A very small circle of Seattle “natives” now recalls events of 90 years ago vividly. 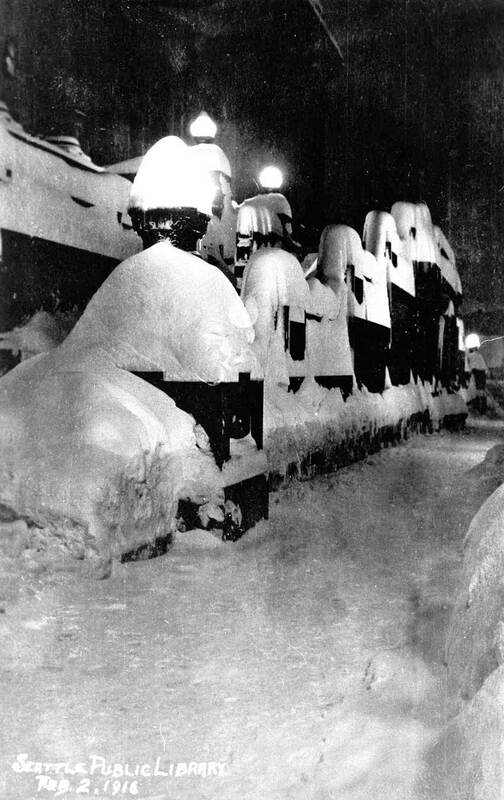 Not so long ago the 1916 blizzard was still remembered. 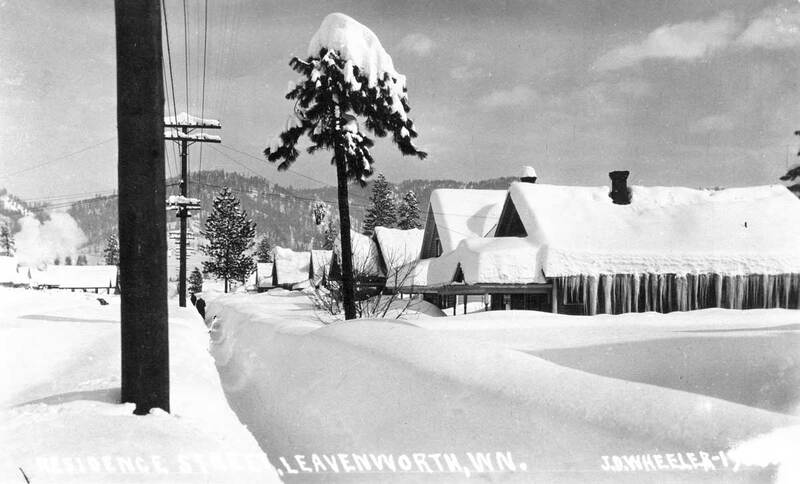 Ten years ago during our latter day big snow of 1996, any born and bred local of, say, 90 would have remembered the snowfall that began in earnest on the late afternoon of Feb. 1, 1916. 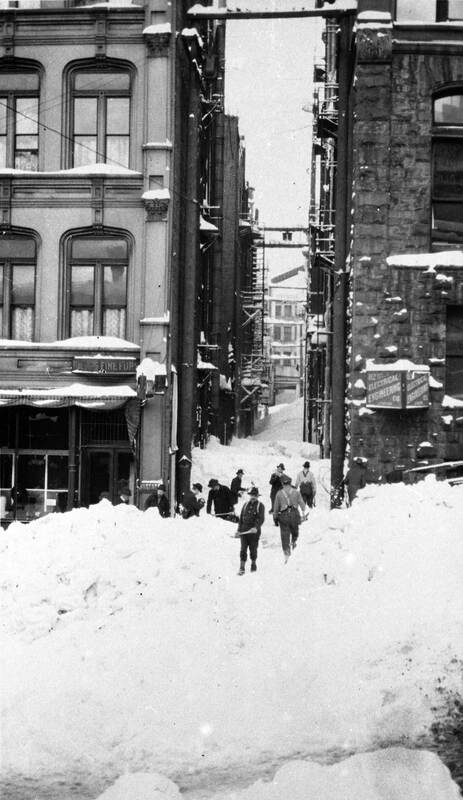 By 5 pm on Feb. 2 the Weather Bureau at the Hoge Building at Second Ave. and Cherry Street measured 26 inches. This is still our 24-hour record. Five hours later the depth reached 29 inches. Canada’s Grand Trunk Pacific Railroad built the ornate pier filling the left foreground in 1914. 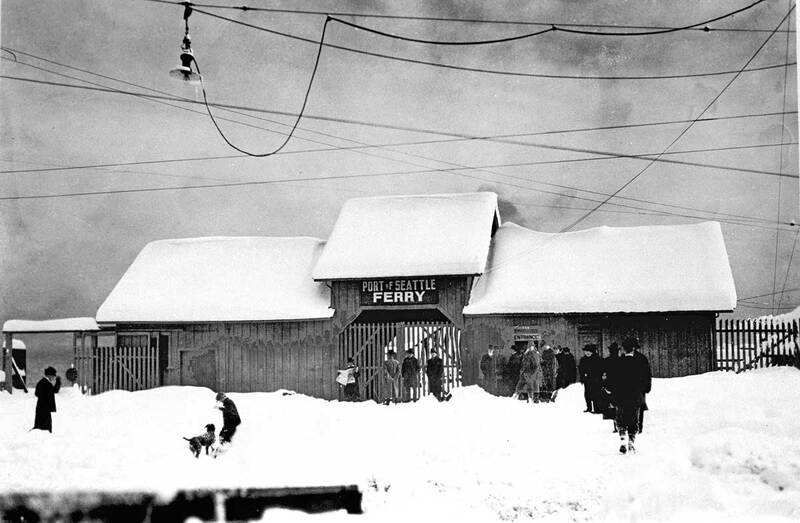 Here passengers could board the railroad’s own “mosquito fleet’ of sleek steamers for a scenic ride north to the railroads west coast terminus at Prince Rupert and there make connections for “all points east.” The railroads first pier here was built in 1911 but destroyed by fire only three years later. This replacement was built in the style of the original designed by Seattle architect James Eustace Blackwell, and survived until 1964, when it was razed for the staging of vehicles waiting to board Washington State Ferries. Another look north on Railroad Avenue from the Marion Street overpass. Fire Station No. 5 on the left, at the foot of Madison Street - still. 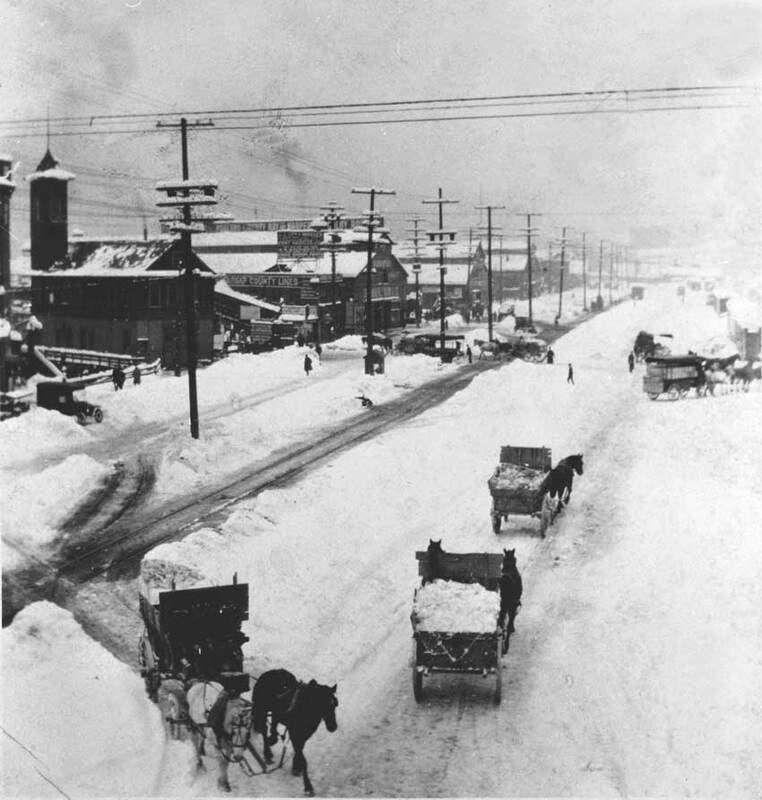 East on Yesler Way from Railroad Ave. during the 1916 snow. 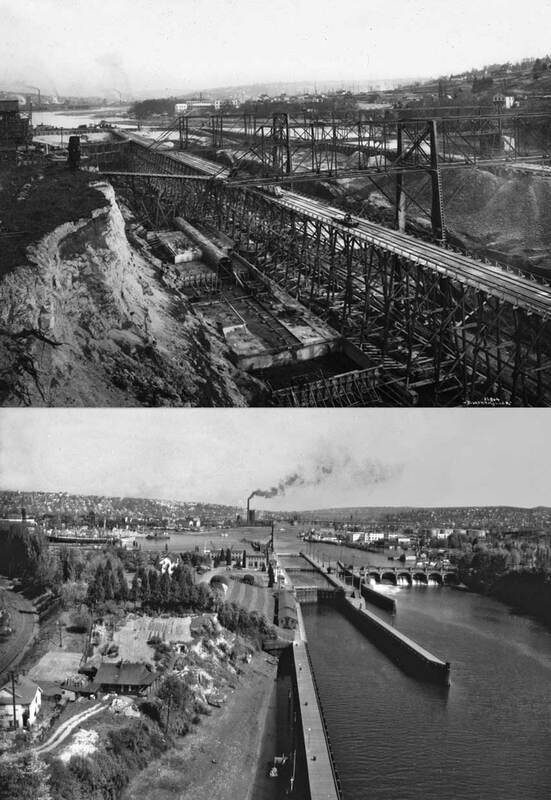 Most of the temporary dirt cofferdam, upper-right, that separated the construction site from the temporary channel was removed in the fall of 1915 after the greats gates to the locks were closed. 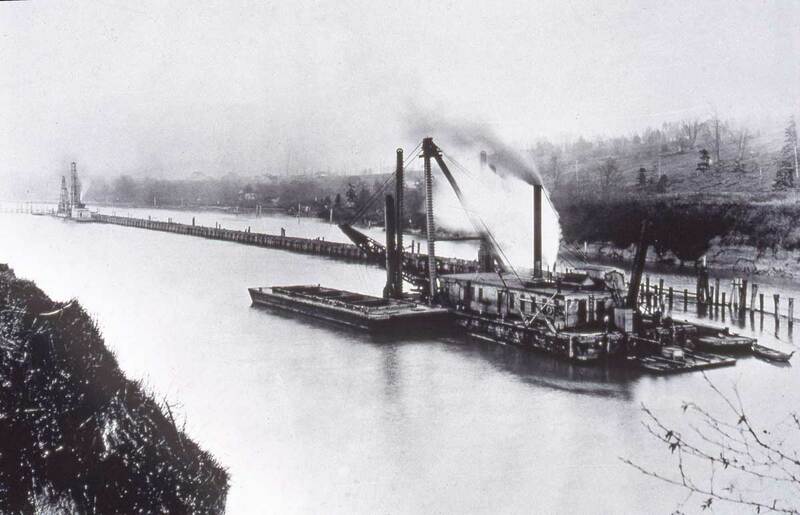 Earlier, the dredge, preparing the pit before the dewatering, sucked the floor of the channel for mud to both distribute by pipeline to the campus built on the north side of the locks and also to build the cofferdam, which is outlined here by the row of pilings positioned on the far side of the dredge. 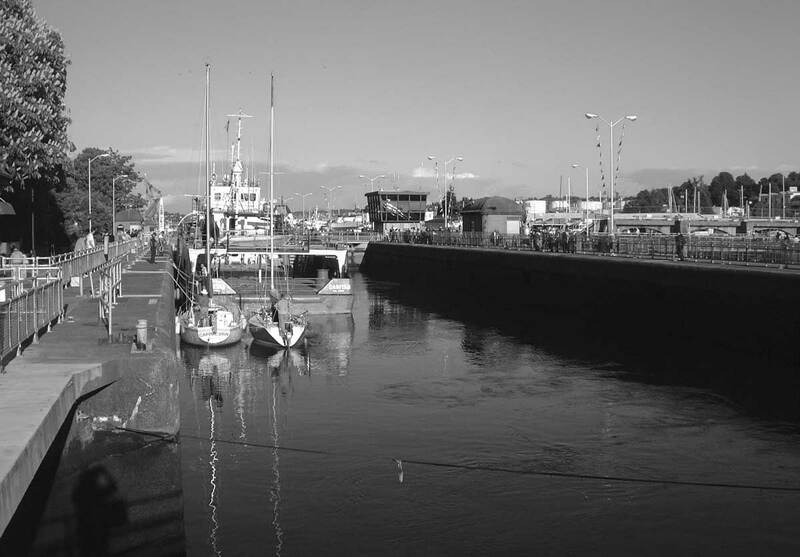 Again, this view looks east-southeast from the Ballard side of the locks. 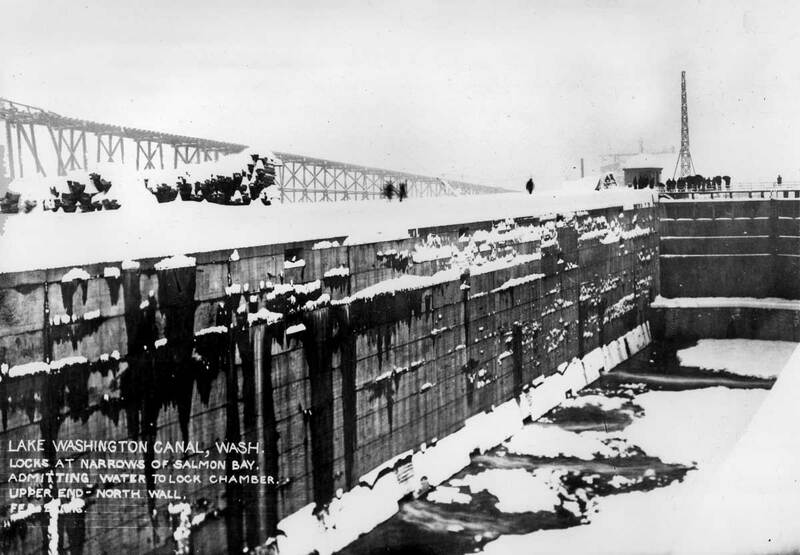 Next, on the second of February 1916 the locks were deliberately flooded and the doors opened to permit commuters to make emergency commutes to downtown Seattle by boat when the “Big Snow” (the second deepest in the history of the city) shut down the trolleys. A repeat of the "dewatered" shot from above and below it an early look at the canal from the Great Northern's Salmon Bay bridge. The smoking mill, top-center, is the Seattle Cedar Mill, which burned spectacularly to the ground in May 1958. 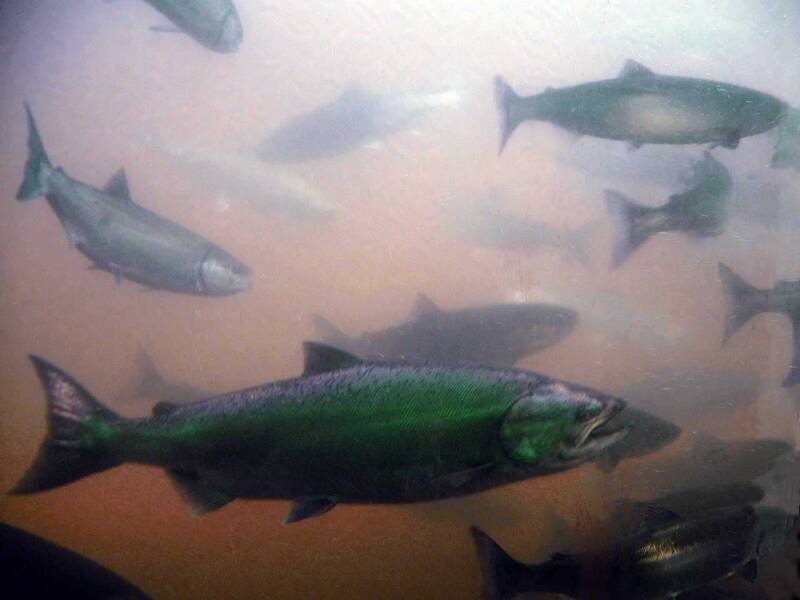 Below is a record of some salmon heading for the lakes through the dam's fish-ladder, at its southern or Magnolia end. 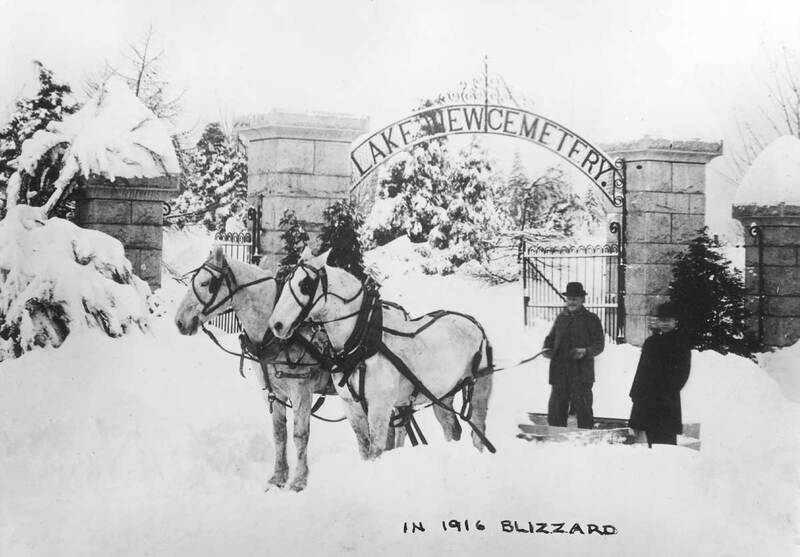 When the Big Snow of 1916 decorated the granite and iron gate at Lake View Cemetery, it was already forty-three years since the first graves were dug there. After pioneer Doc Maynard died in the spring of 1873 he cooled for a month while a road was built from the village to what was first called the Seattle Masonic Cemetery. 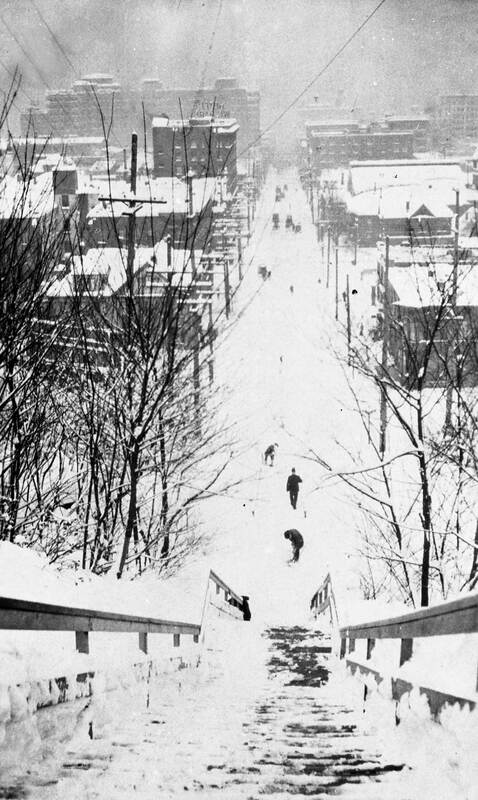 By the early 20th Century when this ridge got its surviving name — Capitol Hill — the original Lake View was so crowded with headstones that the cemetery was doubled to the east as far as 15th Avenue E.
This snow-bound gate is on Fifteenth. But where? Entrances to the cemetery have moved about. Following the lead of a map a few years older than this scene (both map and photograph are in the Lake View archive) I recorded the “now” scene a half block north of the contemporary entrance near E. Garfield Street. (When I can uncover it, this “now” will also show Jean Sherrard across the way, a rare treat.) But I confess that the lay of the land behind this gate looks more like that inside the present gate than it does the steeper incline in my speculative “now” setting. 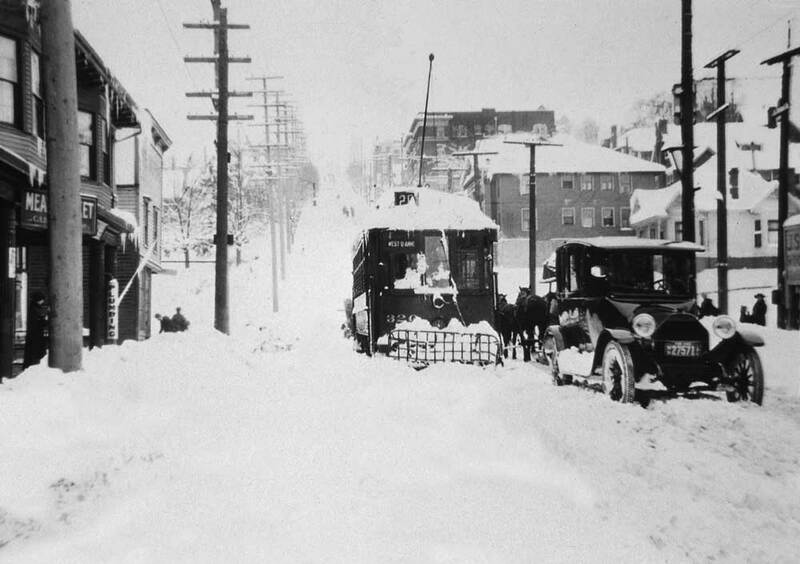 This snow scene is one of more than 100 illustrations in Jacqueline B. Williams’s new 200-page history of Capitol Hill. She lives a short walk from the gate. 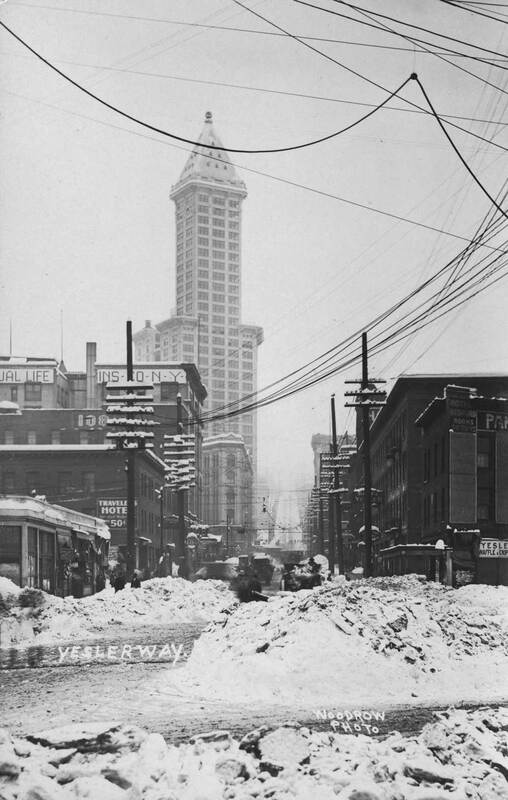 Williams has titled her well-wrought history “The Hill With A Future, Seattle’s Capitol Hill, 1900-1946.” Last spring we reported on it as a work-in-progress and invited readers to help the author with leads. Now they may help her and themselves with purchases. This is the energetic author’s tenth book. Among her other subjects are books on pioneer kitchens and cooking. Through the coming year (2003) we will have many reminders — attached to opportunities — that 2003 is the centennial for the arrival of the Olmsted Brothers. 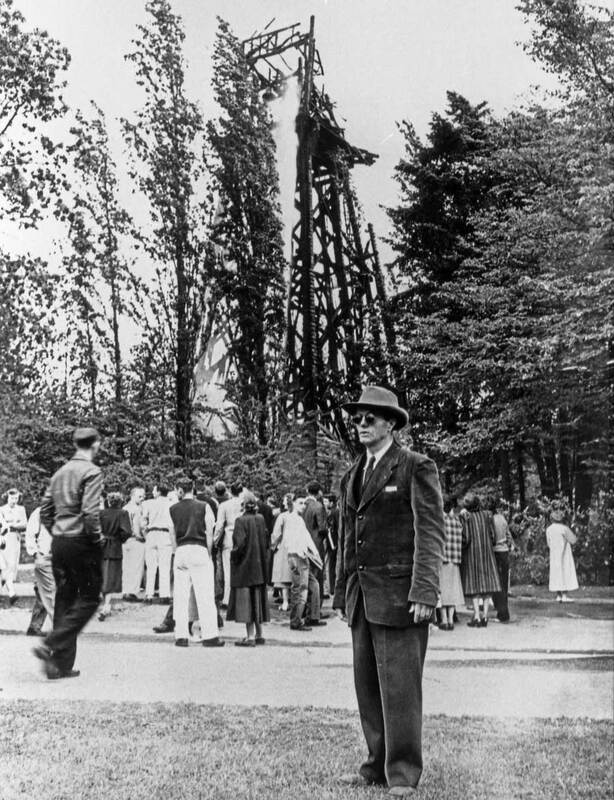 To celebrate the contributions of this pioneer landscape firm, the Seattle Parks Foundation will feature monthly walking tours consecutively through twelve Seattle Parks that were shaped by the Olmsteds, the most celebrated of national activists in the progressive “city beautiful” movement of the late 19th and early 20th centuries. The first tour begins here at Volunteer Park next Saturday, Jan 18 (2003) at 10am. The Olmsted Bros. are still very much with us. 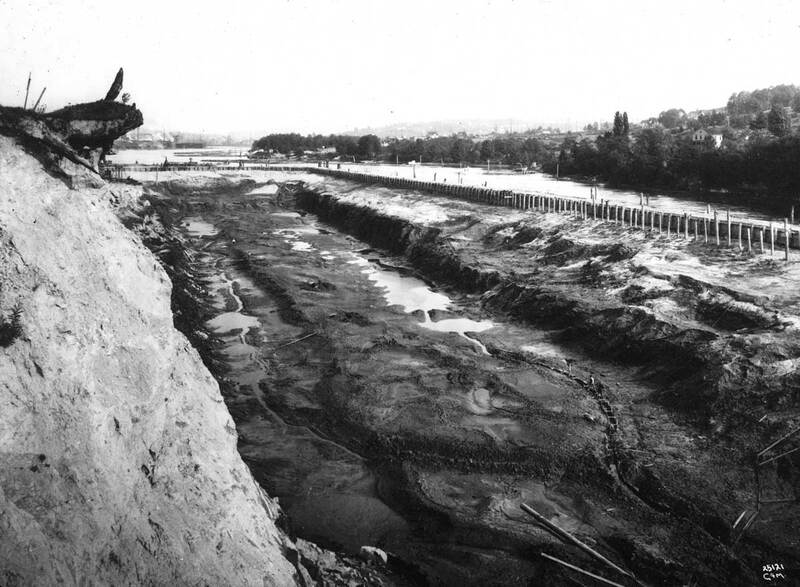 In the more than 30 years that followed the 1903 introduction of their comprehensive plan for Seattle parks the Olmsteds were involved in 37 park projects. 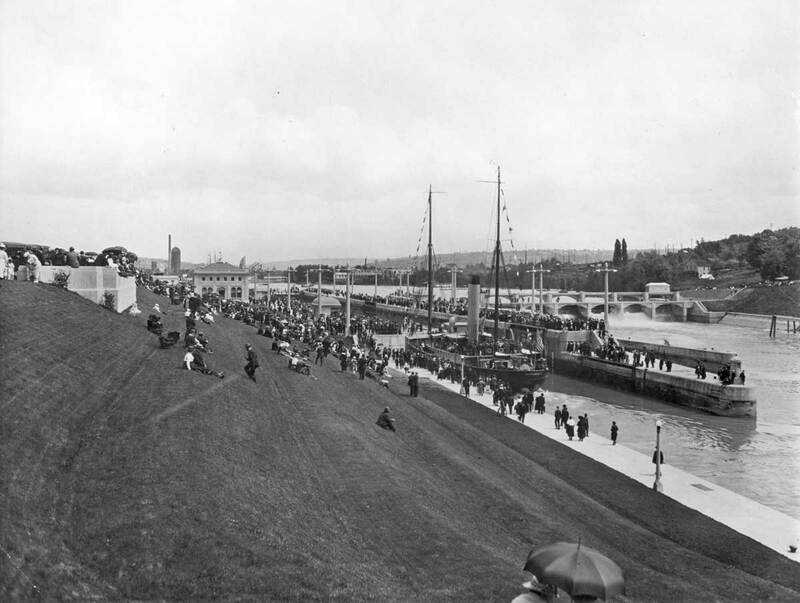 Their near omnipresence is increased if we add our boulevards, the firm’s designs for many private local gardens, and their master plans for the University of Washington campus as well as the 1909 Alaska Yukon Pacific Exposition. The walkway that appears just above the three figures left of center runs between two lily pools that are planned for restoration during the Olmsted Centennial. In 1916 both the glass plant Conservatory (top center) and the charming lattice pavilion (right of center) were but four years old. 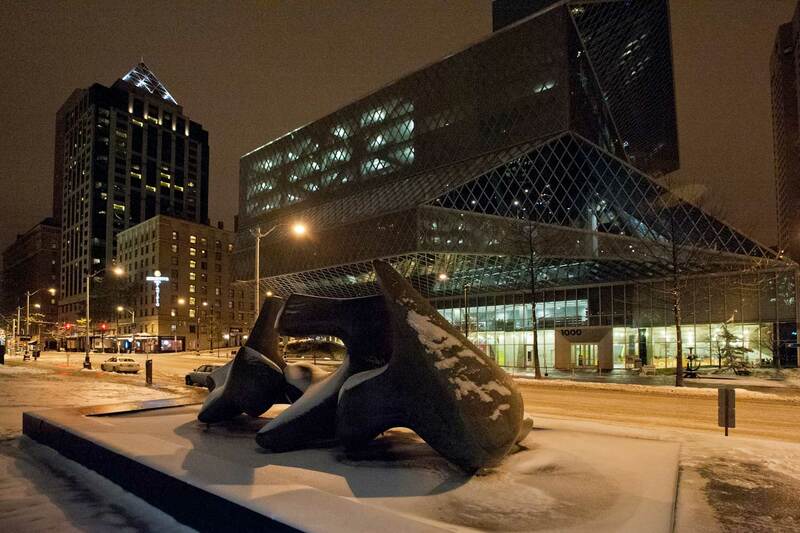 The latter was replaced in 1932 by the Seattle Art Museum. The covered bandstand on the far side of the reservoir is the newest structure in this winter scene. 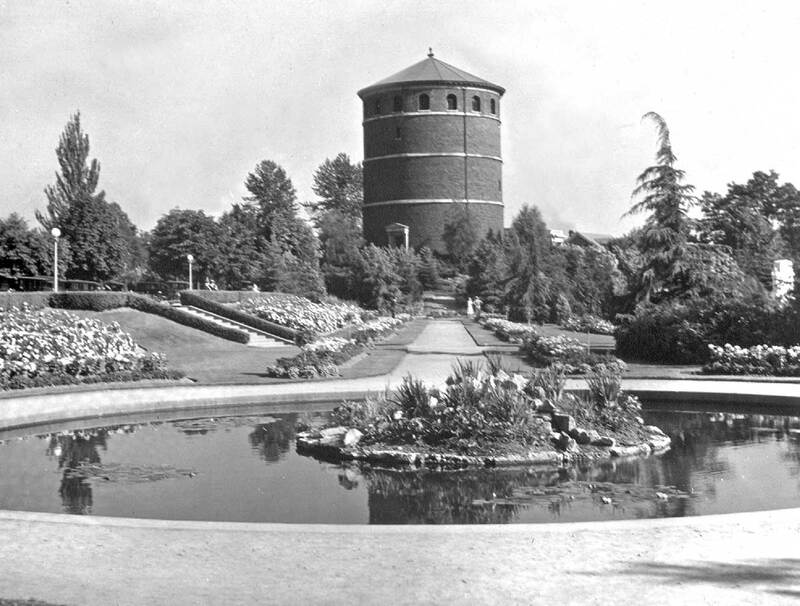 It was completed in 1915 for Volunteer Park’s then frequent and popular concerts. A Volunteer Park snow without a date. [This may still work.] For more information on the Olmsted Centennial including a list of the other parks scheduled for tours you may contact the Friends of Seattle’s Olmsted Parks through their web page, www.seattle.gov/friendsofolmstedparks. 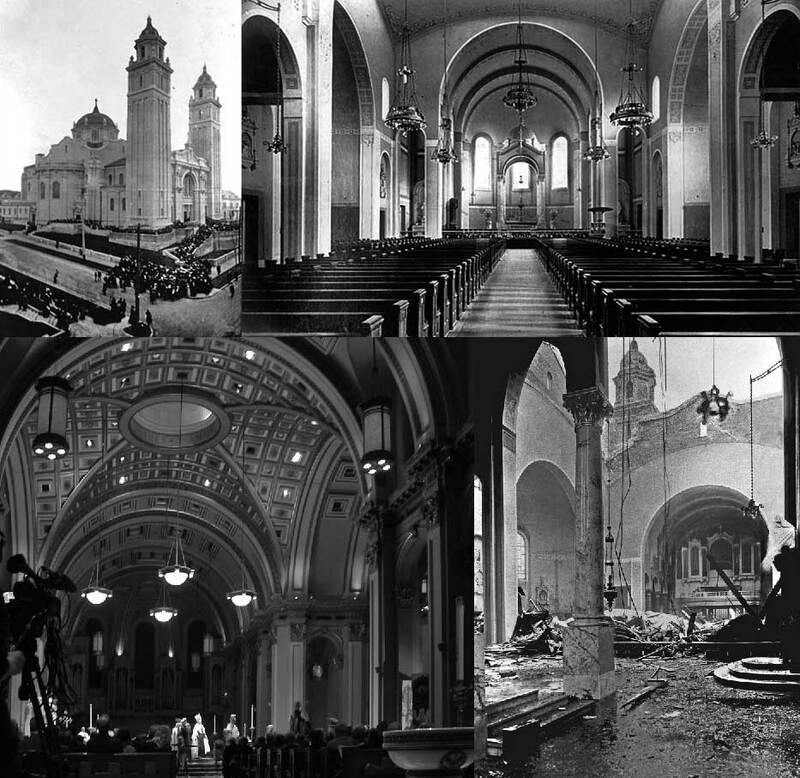 With its dome collapsed under the “Big Snow” of 1916 because of a flaw in its construction, St. James Cathedral has gone through four renovations and/or restorations, the most recent in 1994. Built in 1907 the cathedral is fast approaching its centennial. 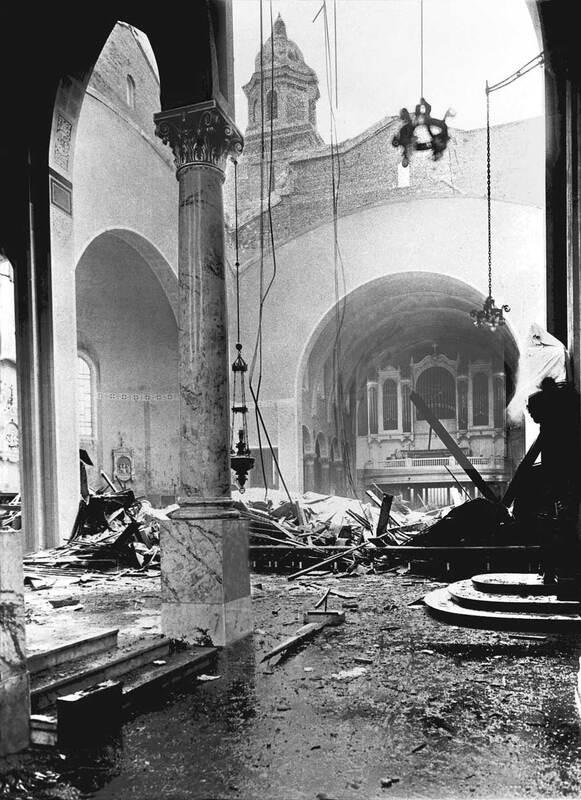 In the accompanying photo most of the ruins are hidden beyond and below the partially crushed altar rail that crosses the scene from the right just beyond the steps to the bishop’s chair. The sancturary was then still elevated four feet above the nave, and the high altar sheltered below its baldachin – a canopy supported by four ornate columns one of which shows in the foreground the historical view. The repaired cathedral was built at one level and the altar now rests directly below the “oculus Dei.” This “eye of God” first returned unfiltered light to the sanctuary a part of the cathedral’s most recent restoration in 1994. 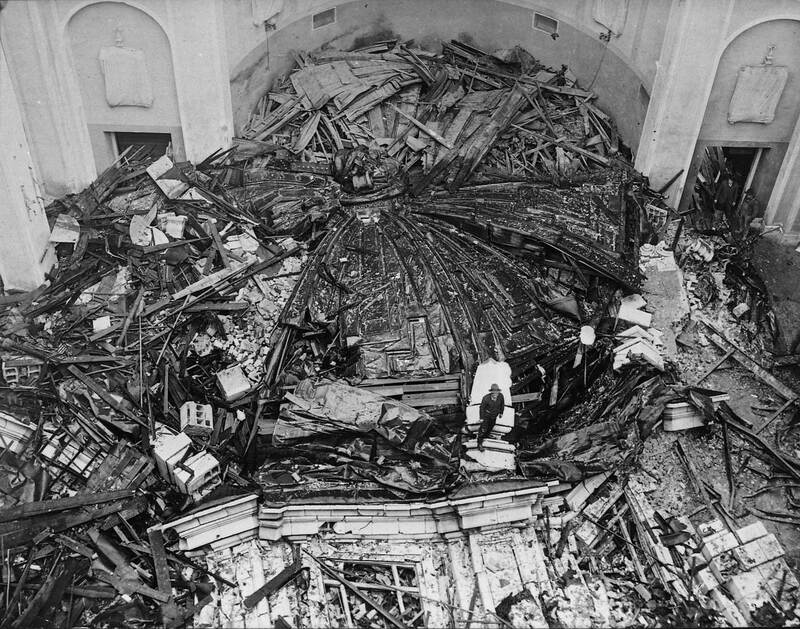 The somewhat neat clutter of the dome following its collapse - seen from the open roof. 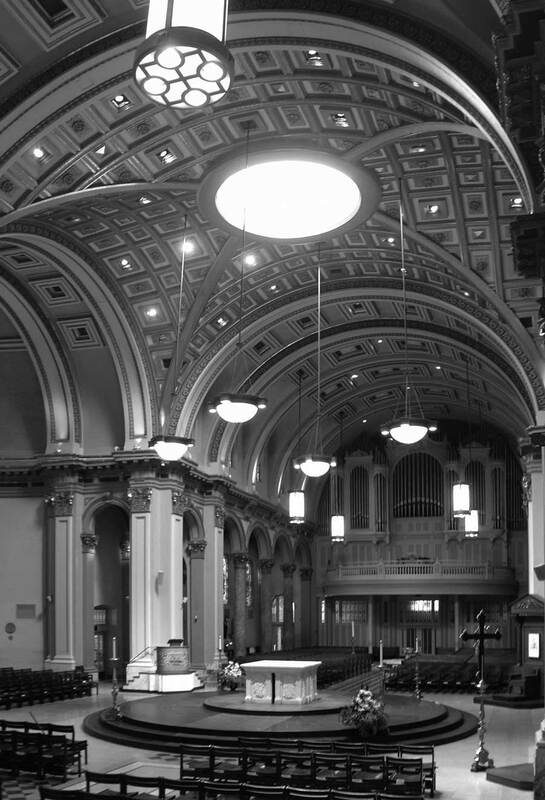 St. James still with its dome, upper-left, and the original interior, upper-right. Bottom left, the interior after its latest changes. 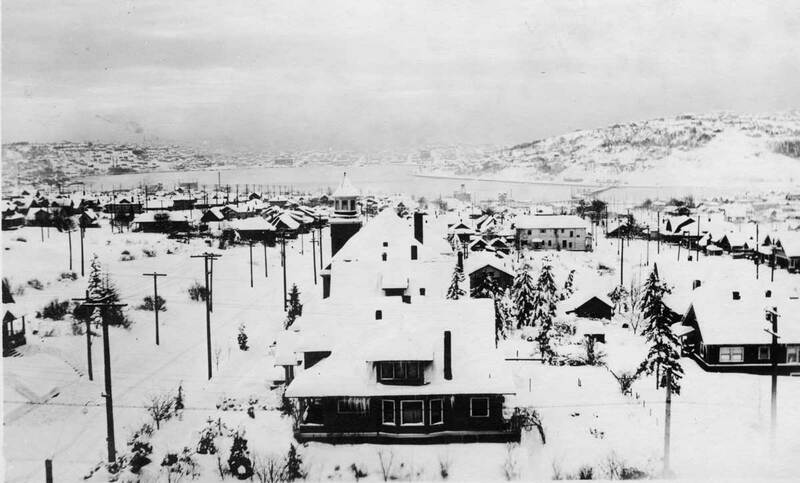 Still in the First Hill neighborhood, and during the 1916 snow, Trinity Episcopal at James Street and 8th Avenue, northwest corner. 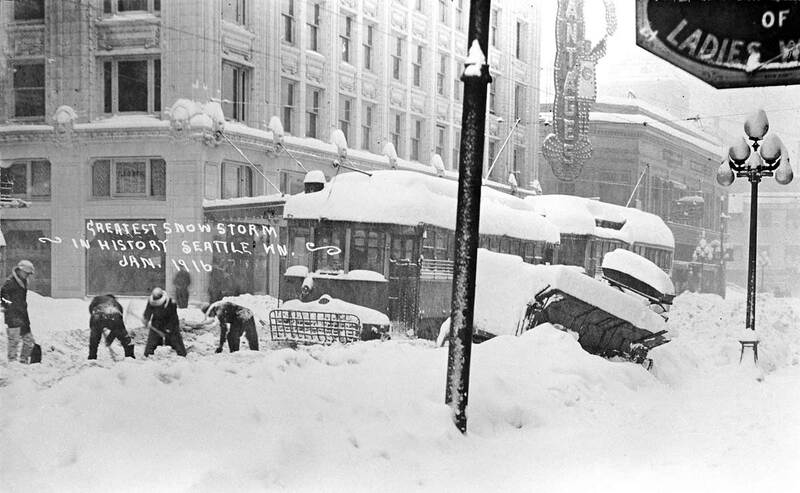 Resting as it does besides the “Mediterranean of the Pacific” Seattle, in its now 154 years, has had only six “big snows”—1861-62, 1880 (the deepest), 1893, 1916, 1950 and 1969. If we join snow-to-mud 1996 may also be added. 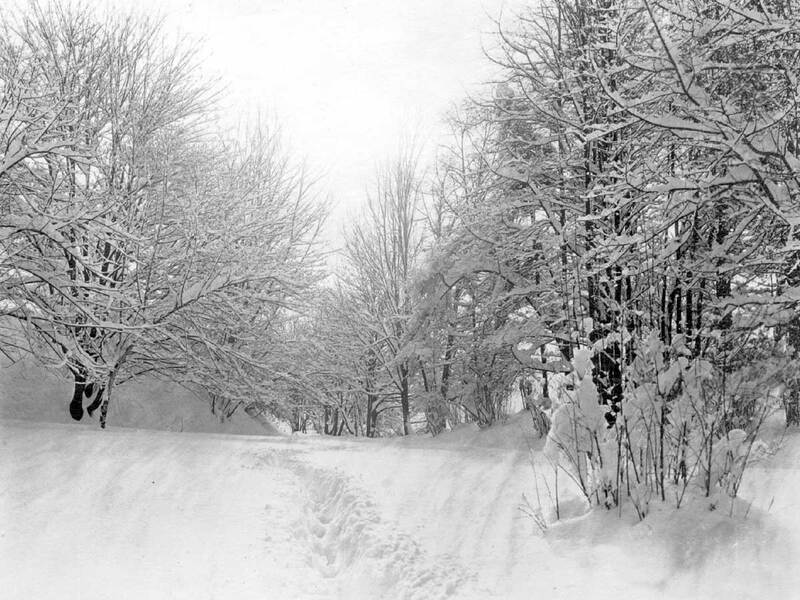 (This was written before the 2008 snow – but was it big?) 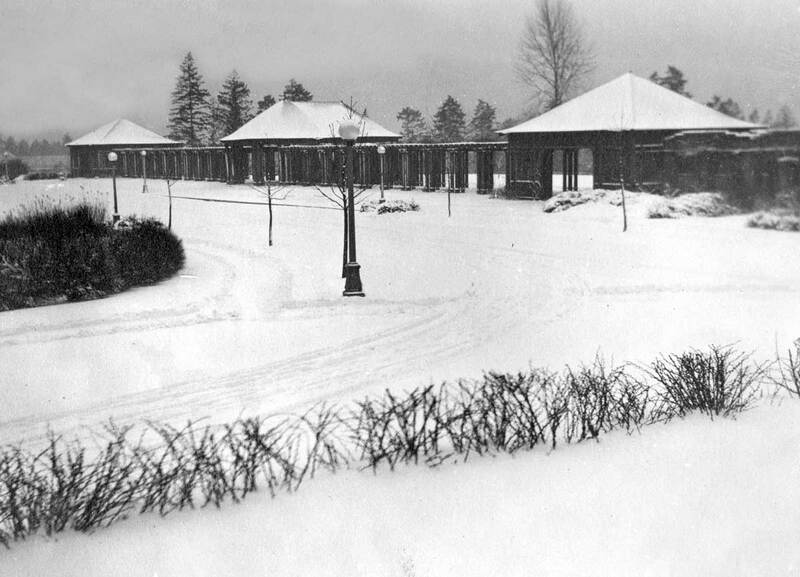 This campus scene is from 1916 – the second deepest of the seven. Historical photo by Werner Gaerisch courtesy of Doreen Delano. Contemporary photo by Jean Sherrard. 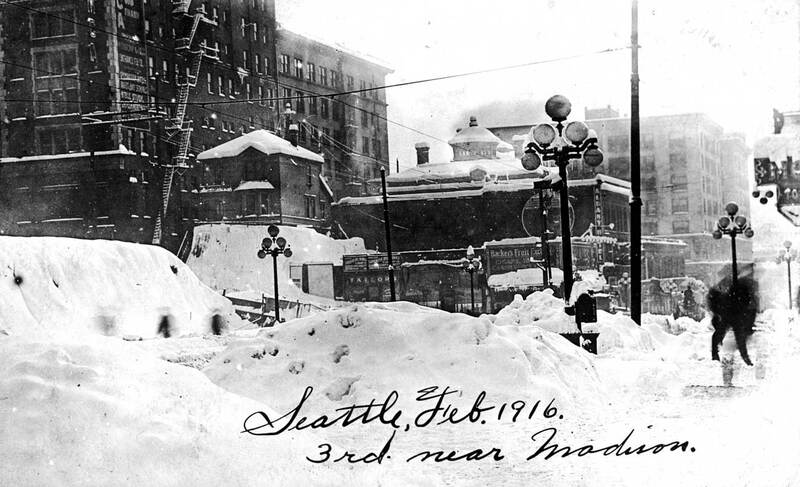 Almost certainly Werner Gaerisch snapped this campus scene during the “Big Snow of 1916” – a February blanket that still measures as the second deepest in Seattle history. At the time the German immigrant was a 24-year old baker with – judging by about 200 negatives preserved by his granddaughter Doreen Delano – an extraordinarily sensitive eye. While the snow itself is perhaps the general subject the Campus Chimes is its centerpiece. 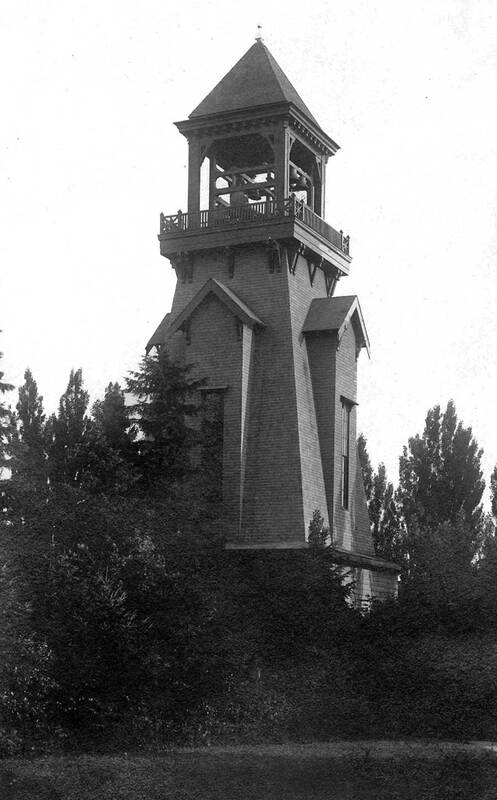 Built originally as a water tower for the new campus in the mid-1890s it was clothed and converted into a Gothic belfry in 1912 when Seattle Times publisher Colonel Alden Blethen donated the bells for it. From 1917 to the tower’s destruction by fire in 1949 it was associated with George Bailey, the blind musician who three times a day played the 12 bells with heavy handles that required two seconds of delay in the keys mechanics between Bailey’s action and the bell’s peeling. Occasionally prankish students who required little ingenuity to break and enter the aging wooded structure also played the bells in the wee hours. Bailey made a practice of composing or arranging a new piece every week and by 1935 remembered many hundreds of them. 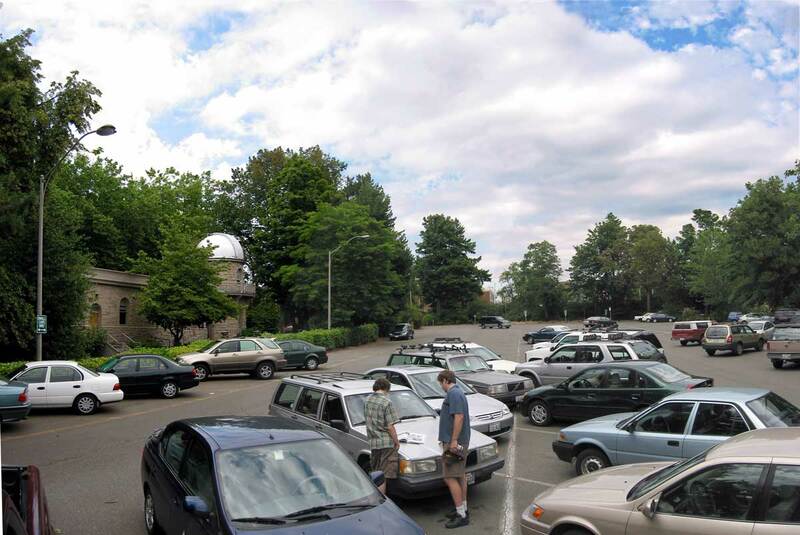 Almost all University of Washington alumni will recognize the observatory. Built from stone left over in the construction of Denny Hall, it is one of the two oldest structures on campus. 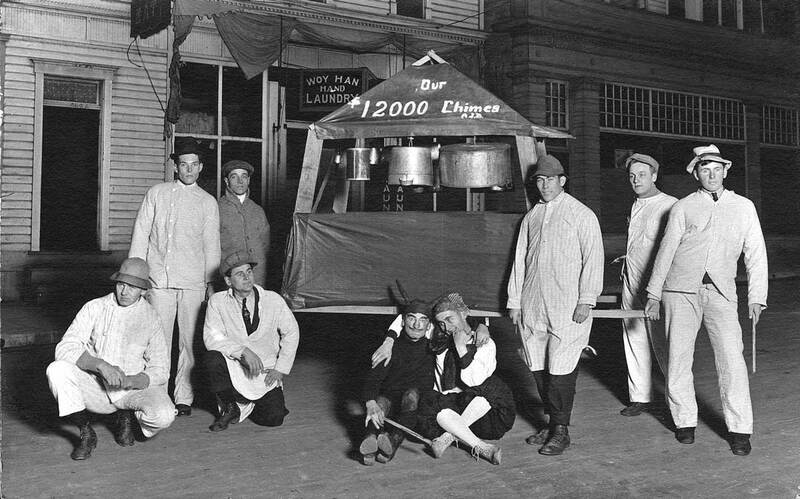 Those who remember the Campus Chimes will recall more the sound than the sight of them. Seattle Times publisher Col. Alden Blethen donated them to the university in 1912. For 32 years, George Bailey made his way 10 blocks from his home to campus, and three times a day he would play the 12 bells. Bailey was blind, but he used neither cane nor guide dog. Rather, he whistled, bouncing his own sonar off the many shapes of the University District. Another George Bailey tradition was sounding the football scores on Saturday afternoons. Using the biggest bell he would play the UW alma mater before peeling forth its points. For the opposition, he used the small bell. Aside from campus hooligans, who would sometimes work the bells at night, Bailey was the last to make music with them. On May 23, 1949, he played “Summertime.” At 7 o’clock the next morning, the tower caught fire. Within 10 minutes, the flames reached 200 feet, dropping burning embers on the roofs of fraternity row. George Bailey was making ready for his walk to campus when he was told of the fire. As the tower burned, Bailey wondered what he would do. 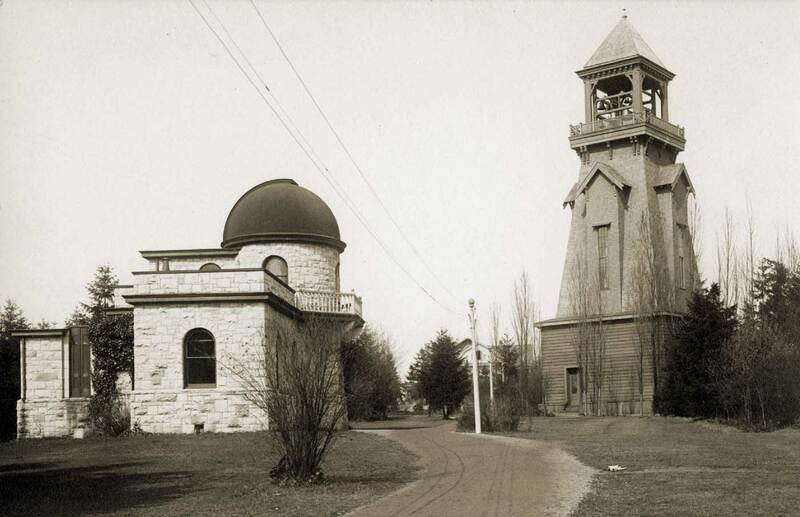 He eventually took care of the new carillon chimes which he played from a keyboard in the music building sending the sounds amplified to speakers in the Denny Hall belfry. With 37 notes, Bailey made new arrangements for his old repertoire. He continued to take requests until his death in 1960. The Blethen Chimes parodied by U.W. Students. 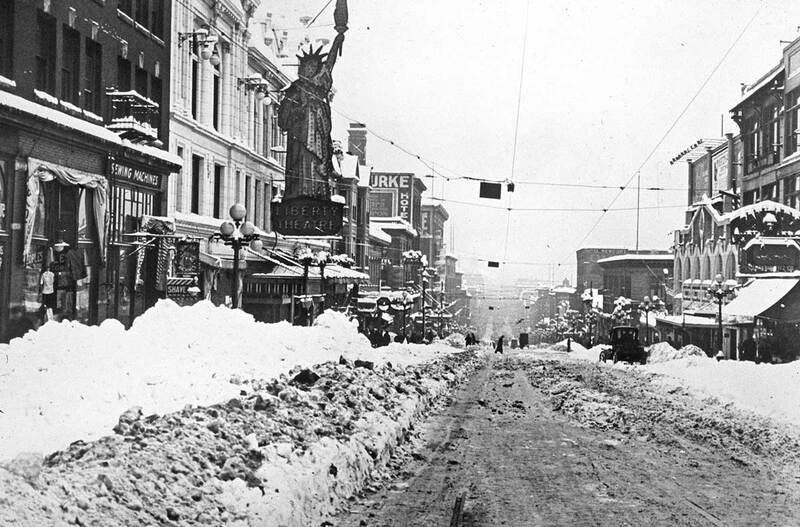 Looking north on 4th from Madison Street during the 1916 blizzard. 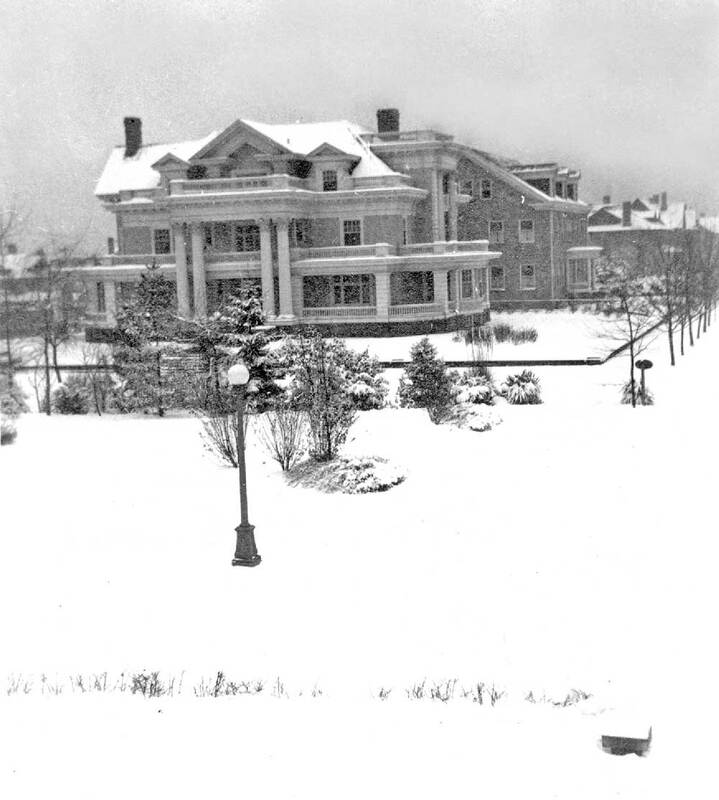 The McNaught mansion appears on the far side of Spring Street at the northeast corner of Spring and 4th, where it was moved from the library site for the latter's construction. Nothing like a big snow to break the generally gray monotone of winters on Puget Sound. And dramatic winter storms offer meteorologists thankful relief from the need to devise new descriptions for a weather which ordinarily rolls from drizzle to drizzle. But most importantly photographers have a field day. 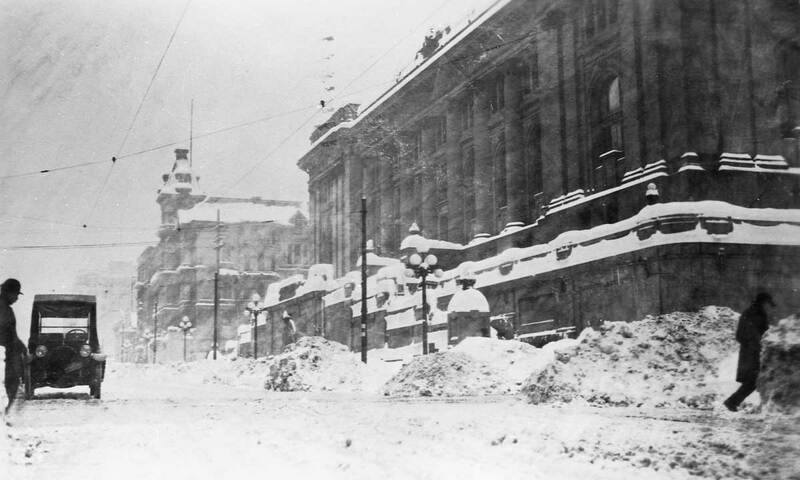 This view of the snowbound Carnegie library was photographed during the first week of February, 1916. 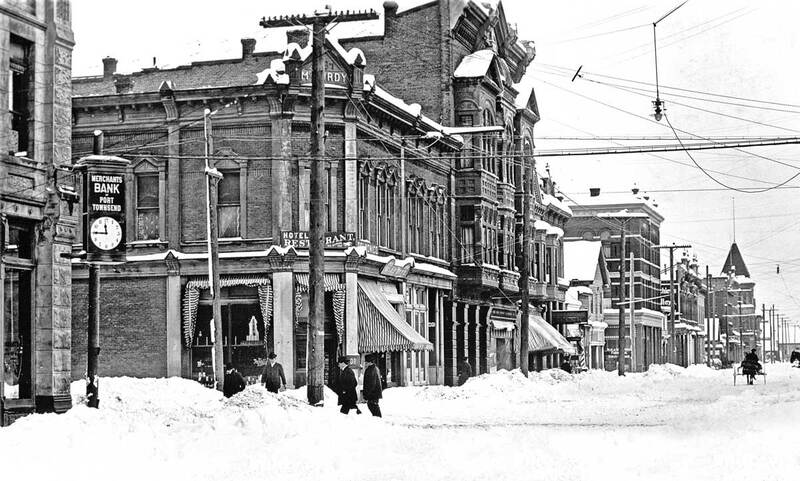 Probably no other natural event has been so embraced by local photographers as the Big Snow of 1916. 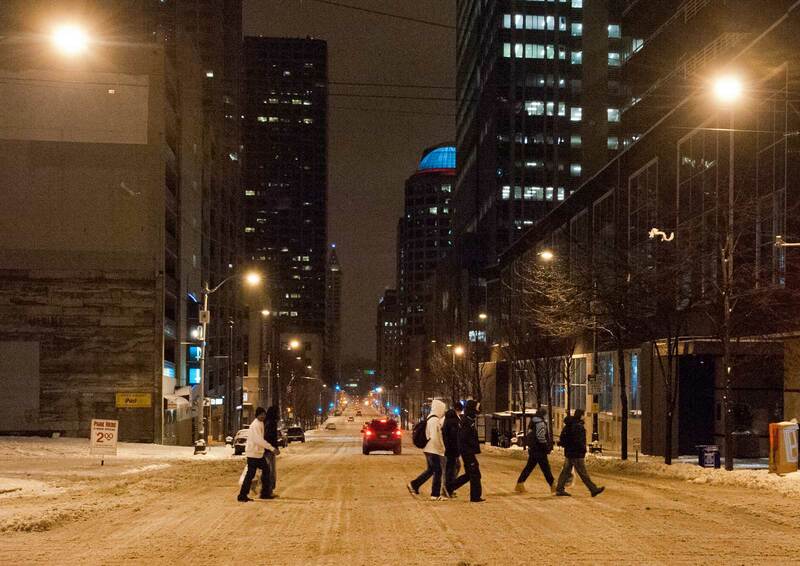 Of course in a city it is the artificial effects of a blizzard that make it such an entertainment. 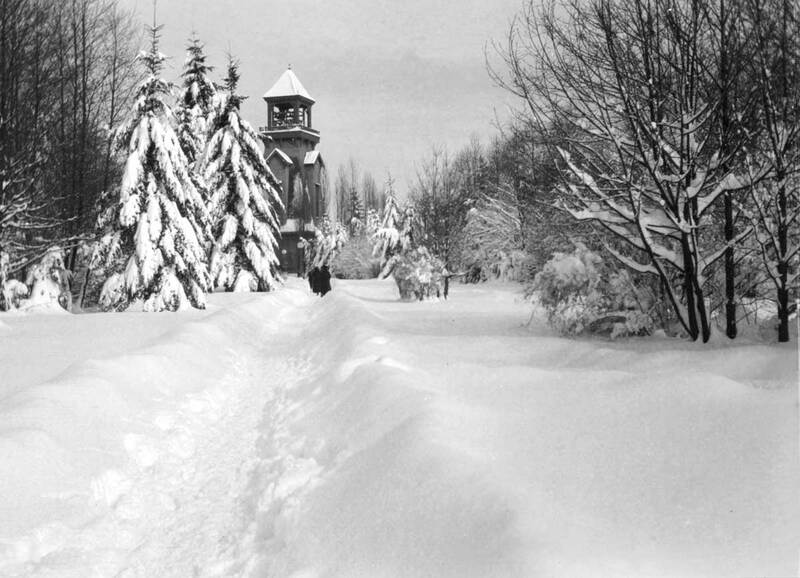 Here with three feet of snow in two days the town’s electric and cable railways were shut down for a week, the schools closed, and a number of roofs collapsed one of them a landmark — the octagonal copper-skinned dome of St. James Cathedral. But here on Fourth Avenue the big snow’s effects are decorative not disastrous. 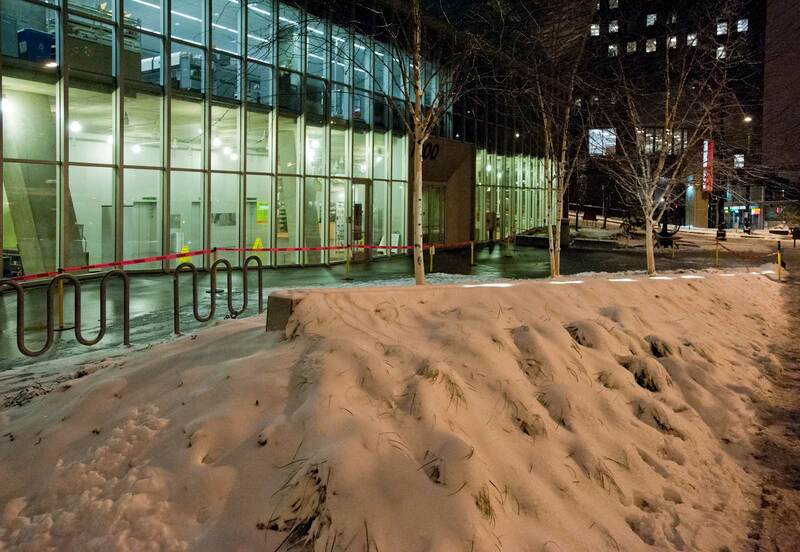 The snow’s frosting, especially on the library’s grand front entry, is quite appealing. This stairway was not part of the library’s original design. Almost immediately after it opened in 1907 Fourth Avenue was regraded, lowering it here nearly to the level of the central libraries basement. Both views look north across Madison Street. One block north, across Spring Street, the blizzard continues its display on the overhangs, reliefs and faceting of the McNaught mansion . Built in 1883 on the future site of the Library, James McNaught’s big home was moved across Spring Street in 1904 to make way for construction of the neo-classical granite and sandstone pile bankrolled with the help of steel capitalist Andrew Carnegie’s $220,000 donation. The two landmarks stood across from one another on Spring Street until the late 1920s when the McNaught mansion was razed for the Kennedy Hotel. The library held on until 1956 when it was knocked down for the modern library recorded in the “now” view (not included here). 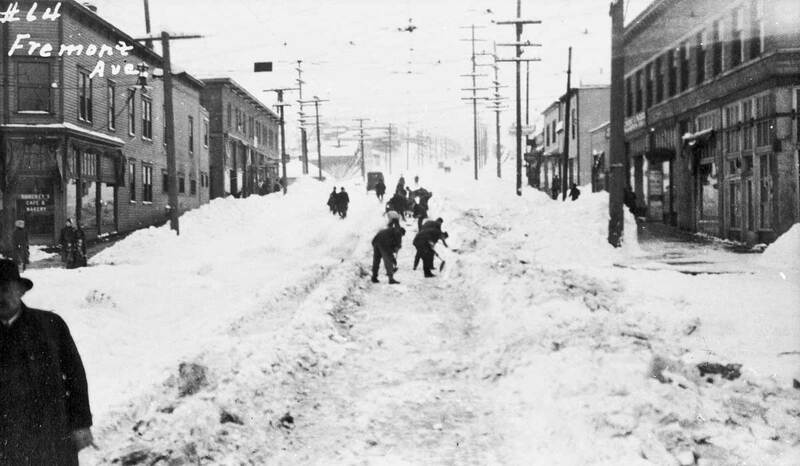 The Big Snow of 1916 melted quicker than it fell and with considerably more disastrous effects. The unseasonably warm and wet whether that followed loosened the many exposed home sites on Seattle’s hills crashing dozens of them to smithereens below and taking two lives. The alley sides and contrasting skins of the Burke Building, on the right, and the Hotel Stevens, on the left, looking north across Madison Street between Second and First Avenues. 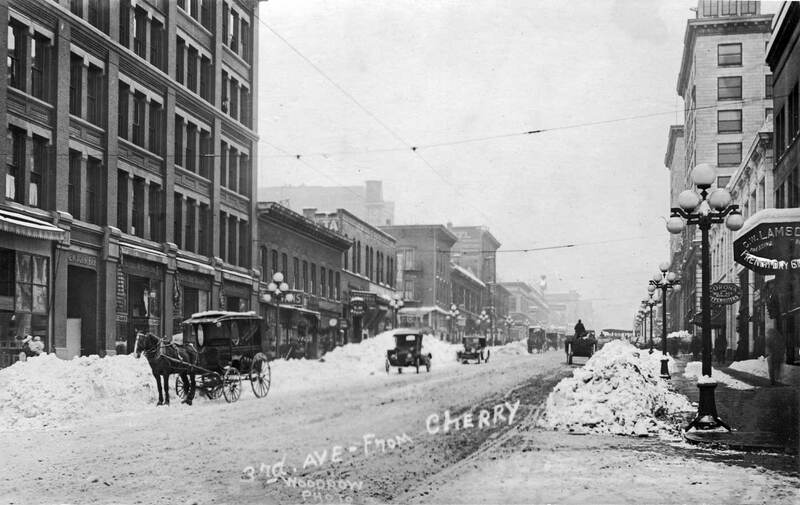 THIRD AVE. north from Cherry Street, with the Central Building (still standing) on the right. Looking north on Fremont Ave. thru 35th Street. The QUEEN ANNE COUNTERBALANCE looking north from Mercer Street. Green Lake from the east shore. Long ago we included a feature on this subject in this blog. The WALLINGFORD NEIGHBORHOOD looking from an upper floor - or roof - of Lincoln High School. Second Avenue looking north with the Savoy Hotel on the right. The 1400 block on 3rd Avenue, looking north. 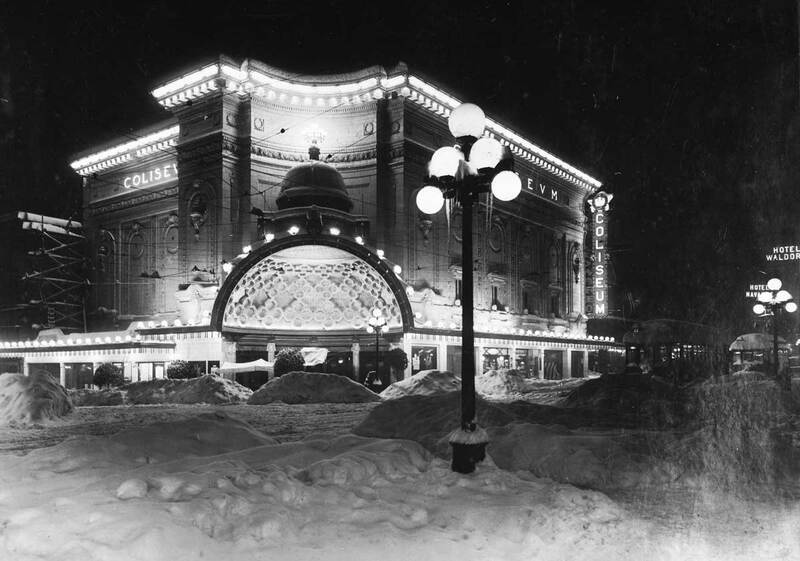 The brand new Coliseum Theatre at the northeast corner of 5th and Pike. West Seattle Ferry Dock on the West Seattle side. Pantages Theatre looking south on Third from near Union St. 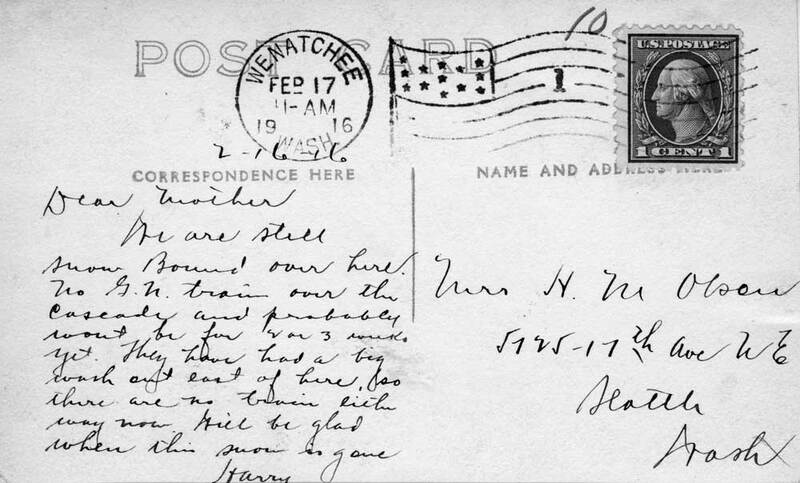 The stained flip-side of this postcard and its personal message is printed directly below. Hard to read but not impossible. The message here is flip-side to the card above it. Leavenworth, and next its flip-side message. The Parker Home, southeast corner of 14th Ave. (aka Millionaire's Row) and Prospect Street. 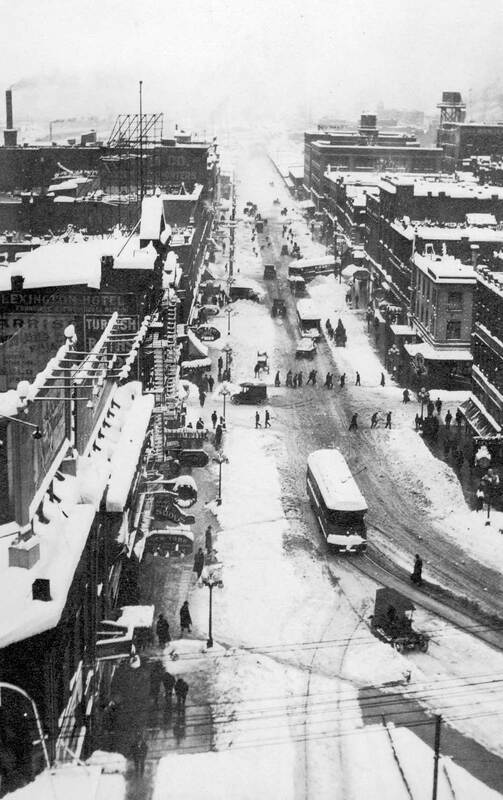 Second Ave. from the Smith Tower, before Second was extended south to the railroad stations and directly in line with its path north of Yesler. 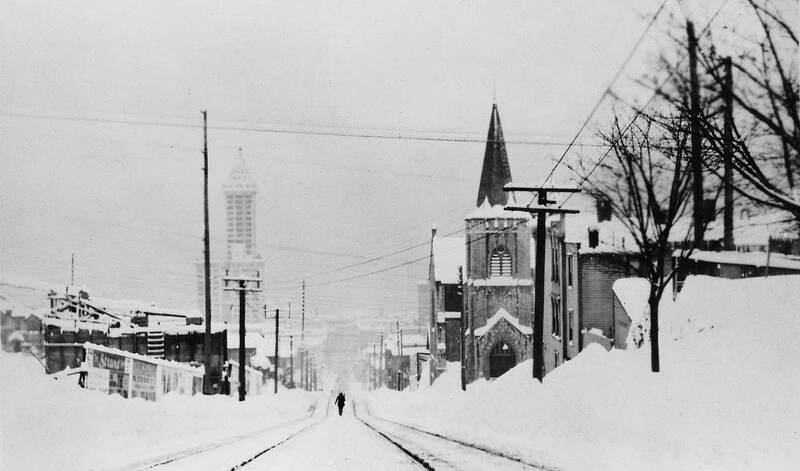 Ballard Avenue, looking north towards the Ballard City Hall, with the tower. 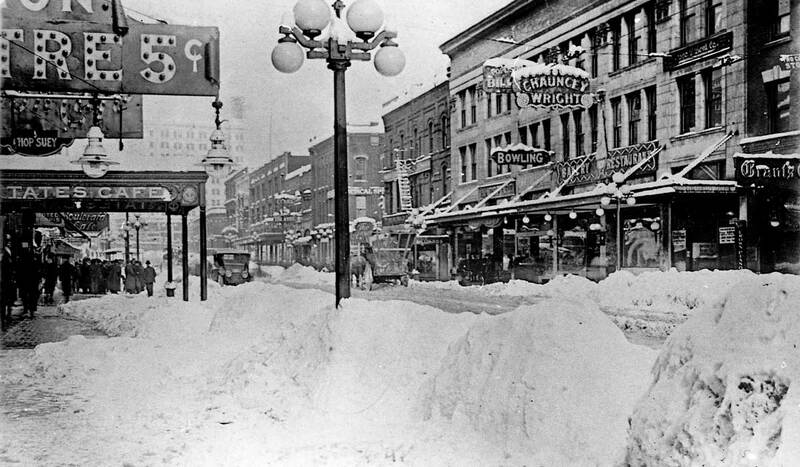 First Ave. south from Pine Street with the Liberty Theatre on the left and the Corner Market Building on the right. Wonderful photos! My 96 year old mother and I so enjoyed looking at them and learning about the big snow of 1916.